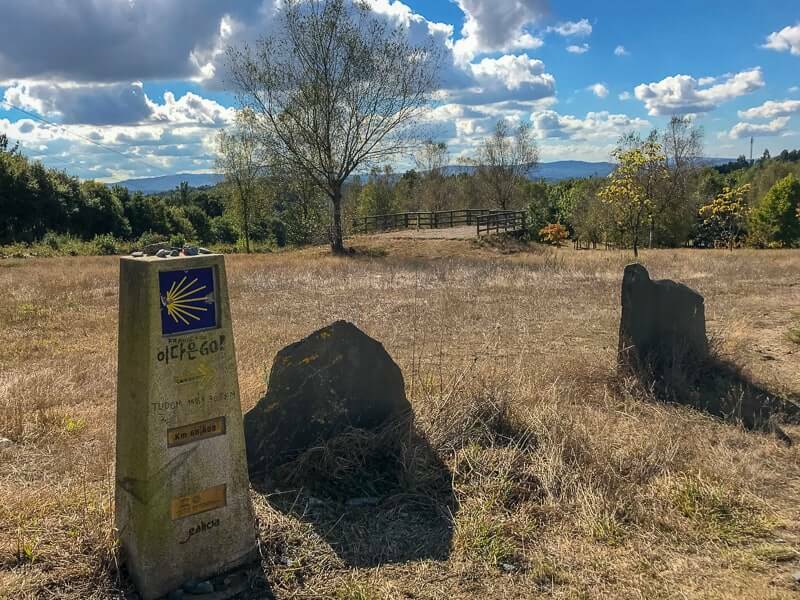 Interested in walking the last 100 km of the Camino de Santiago in Spain? Read on to find out what it’s really like to walk this 1000-year-old route which attracts 200,000 pilgrims each year. In the end, I arrived in Santiago de Compostela feeling totally at peace. And perhaps that’s one of the greatest gifts a pilgrim could ever receive. 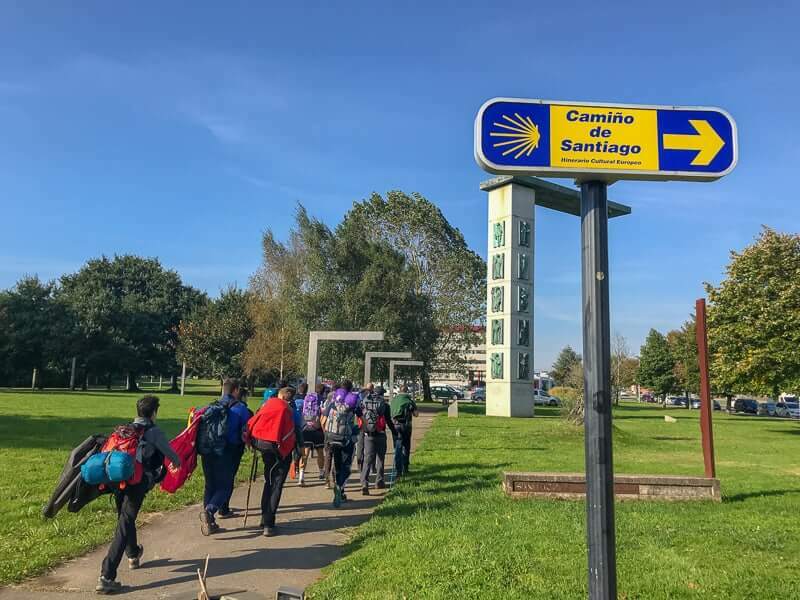 El Camino de Santiago, or in English The Way of Saint James, is the pilgrimage to the Cathedral of Santiago de Compostela in northwestern Spain. Legend has it that Saint James, Jesus’s apostle is buried here – although no one really knows for sure. The Camino has been a Christian pilgrimage for over a 1000 years. At it’s most popular periods in medieval times, a million pilgrims would walk the entire route. It was only one of three pilgrimages, the other two being to Jerusalem, and to Rome which could free a person from the penance of their sins. Today, approximately 200,000 pilgrims walk the route and while many don’t walk it for religious reasons, it maintains a spiritual element with many pilgrims seeking meaning in their lives or who are seeking peace. 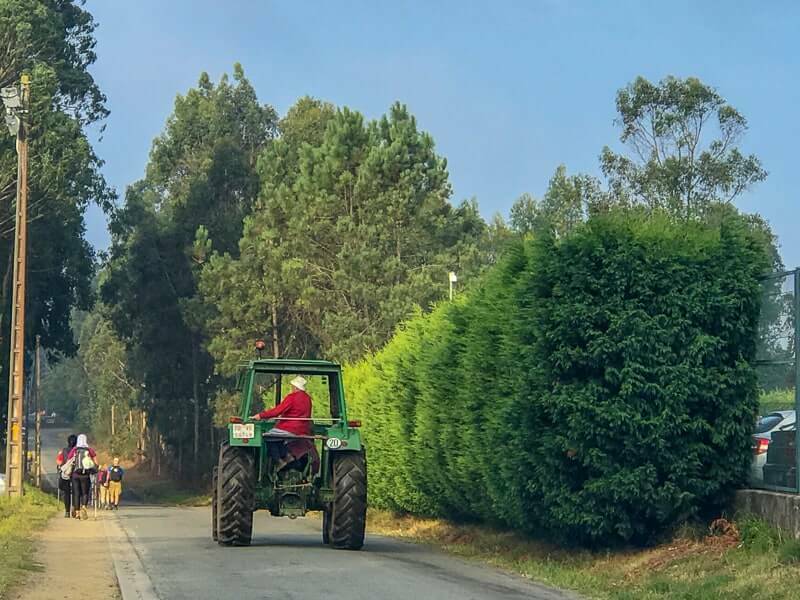 I choose to walk the last 100 km as a self-guided tour with CaminoWays.com. Use the code “monkeyscamino” and you’ll receive €20 off your Camino when you book with them. They book all your accommodations, arrange luggage transfer and provide you with walking directions and a 24/7 number you can call should you need help while on your tour. I’m a HUGE fan of self-guided hiking and walking tours (most of the tours I offer are self-guided for this reason). They give you the flexibility to hike at your own pace, start at whatever time you like, take as few or as many breaks as you want and they save you a TON of time in planning your tour. You can print off the documents they send you, have a quick read and you’re good to go! I also like knowing that after a day of hiking I can look forward to a nice hotel since they’ve already vetted all the accommodations. We’ve all booked places that looked soooo nice on online…only to find out that the reality is quite different. It’s never a nice surprise, but especially after a day of hiking when you’re tired and just want to put your feet up. USE THE CODE ‘MONKEYSCAMINO’ AND GET €20 OFF YOUR CAMINO! 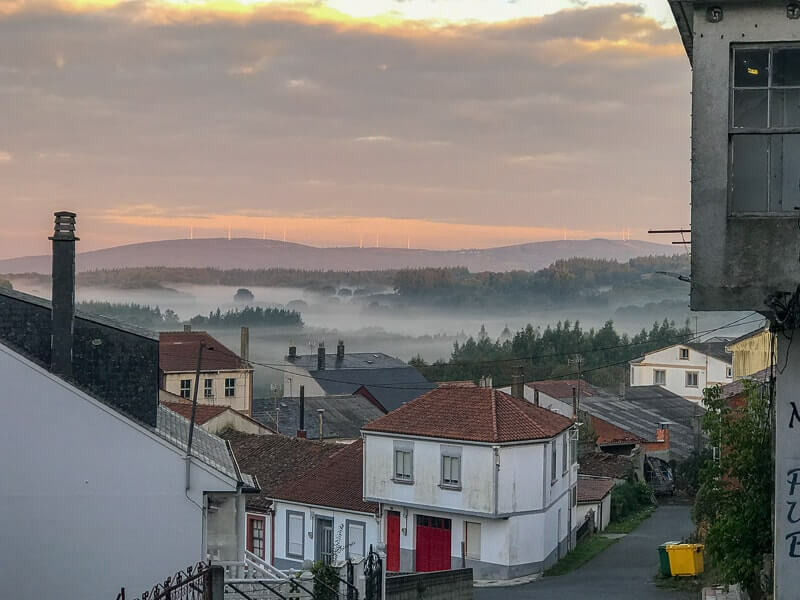 The last 100km of the Camino de Santiago starts in the town of Sarria. 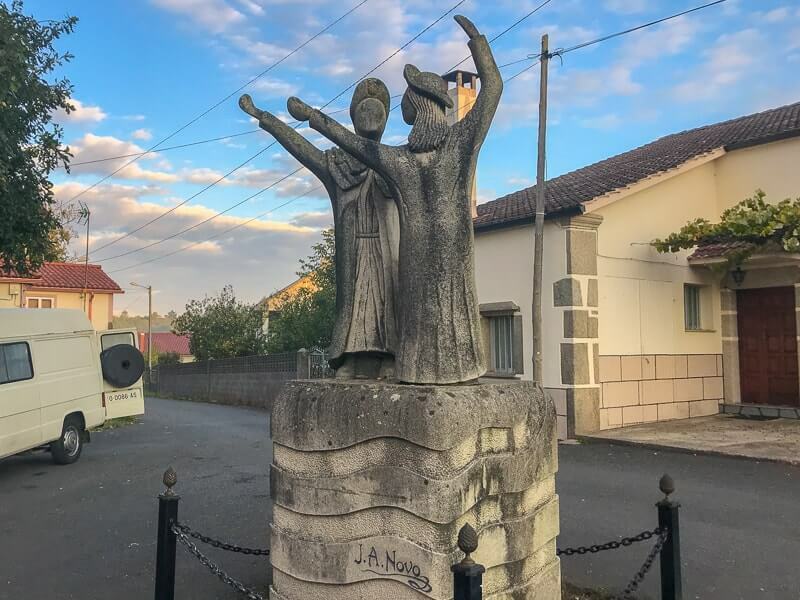 With just under 14,000 inhabitants it’s the most populated town you’ll come across on the Camino until you reach Santiago. 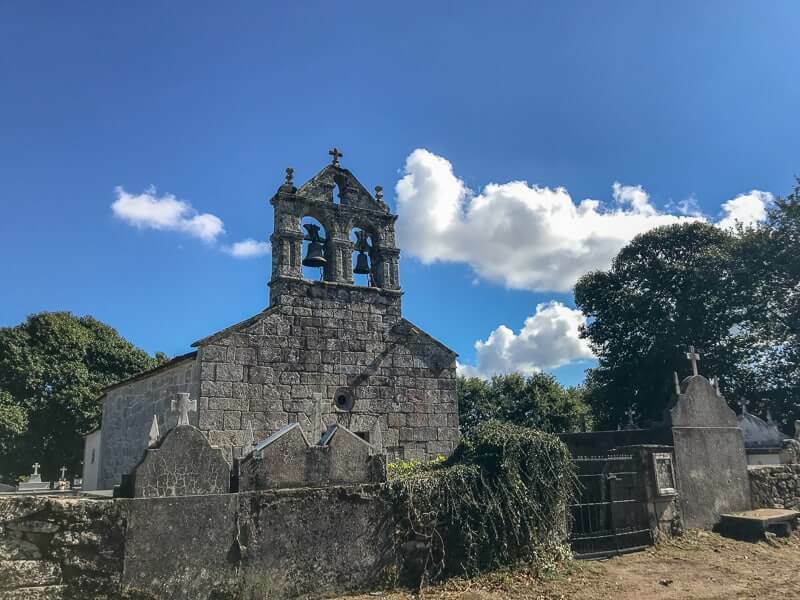 The easiest way to reach Sarria is from Santiago de Compostela, the end point of the Camino. It’s 126 km. You can reach it by bus which takes ~ 2 1/2 hours. You can take a bus directly from the airport to Lugo which takes just over 2 hours. From Lugo, you take another bus to Sarria (~ 30 minutes). In total it costs ~€14. This is the cheapest way to reach Sarria. However, depending on when your flight arrives you could end up waiting several hours as I did. Check the bus schedules (http://www.empresafreire.com/html/ingles/seccion3a.php) from Santiago to Lugo, and then http://www.monbus.es/es to see the times from Lugo to Sarria. It’s also worth noting that it may be faster to take a bus from the airport to the bus station in Santiago and go with another bus company. If your flight doesn’t coincide with the bus schedule, consider a private transfer which CaminoWays.com can arrange. It will be more expensive but is the fastest way to reach Sarria. 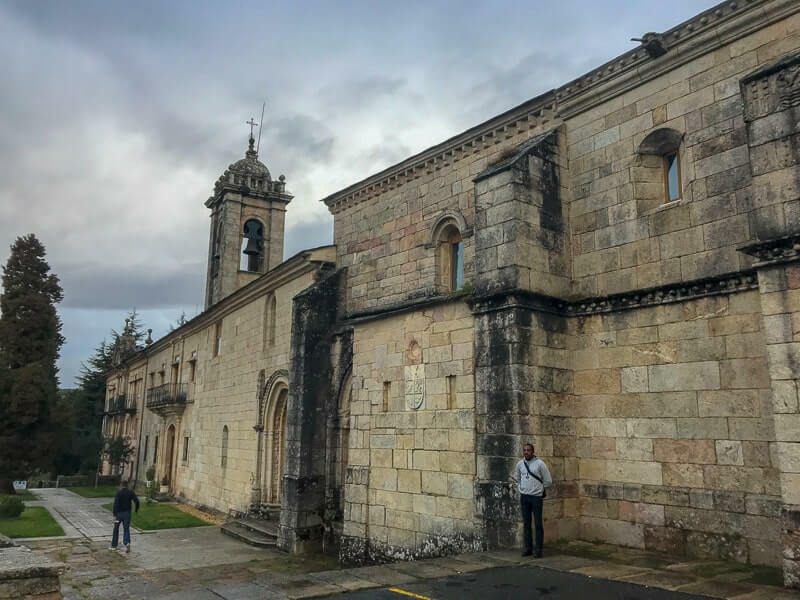 Despite it being a large town compared to the other places you’ll pass on the Camino there’s not a ton to do here, so plan to arrive late afternoon. 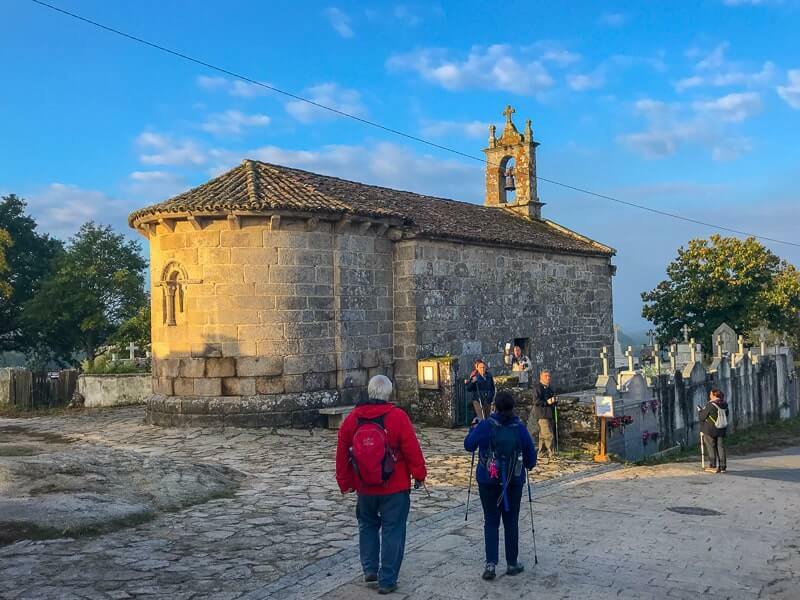 There’s a shop conveniently located at the start of the stairs where you’ll start your Camino and you can purchase last minute gear and your Pilgrim Passport (€2) here. Dinner is on your own but you’ll find lots of places to eat along Rúa Maior (Calle Mayor). You’ll walk through pretty villages and hamlets passing numerous churches and monasteries along the way. You’ll walk on quiet country roads and under oak trees. There are lots of places along the way to stop for refreshments or a bite to eat. 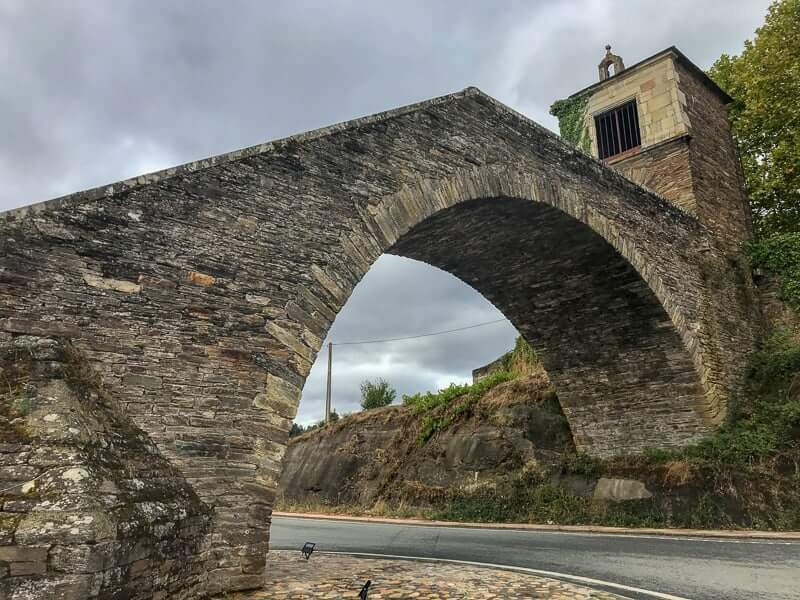 View of Portomarin and the dramatic bridge you cross to reach the town. Actually starting to hike the Camino – something I’ve thought about doing for a long time but haven’t until now. Seeing and feeling the excitement of the other pilgrims. Some have been Camino Frances (French Way) since the beginning, but many others started in Sarria as I did. Entering Portomarin on the dramatic Romanesque bridge with other pilgrims. That was cool in-itself. 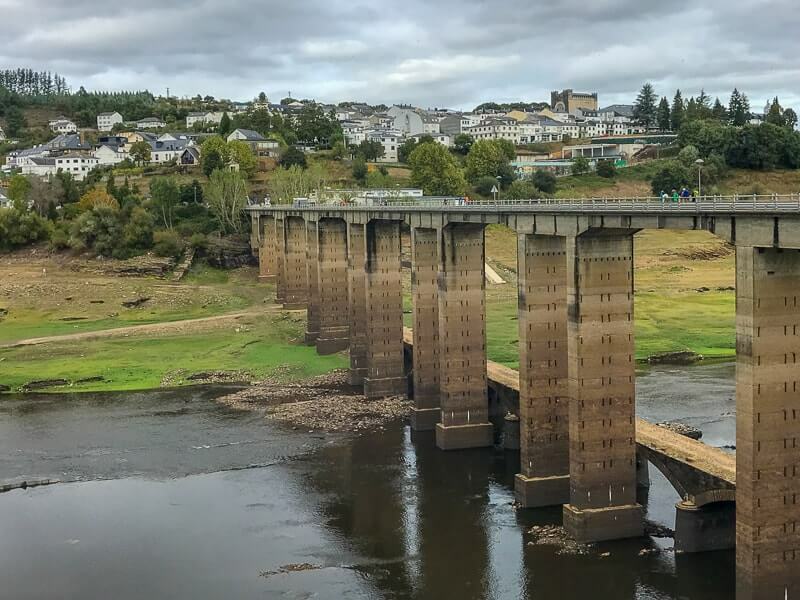 But what I loved was seeing the remains (only visible when the water levels of the dam are low) of the ancient buildings along the Miño River. It gives it an eery ghost town feeling. The buildings that you see used to be Portomarin but when the river was dammed in the 1960s the entire town was moved. The important buildings were moved – stone by stone. 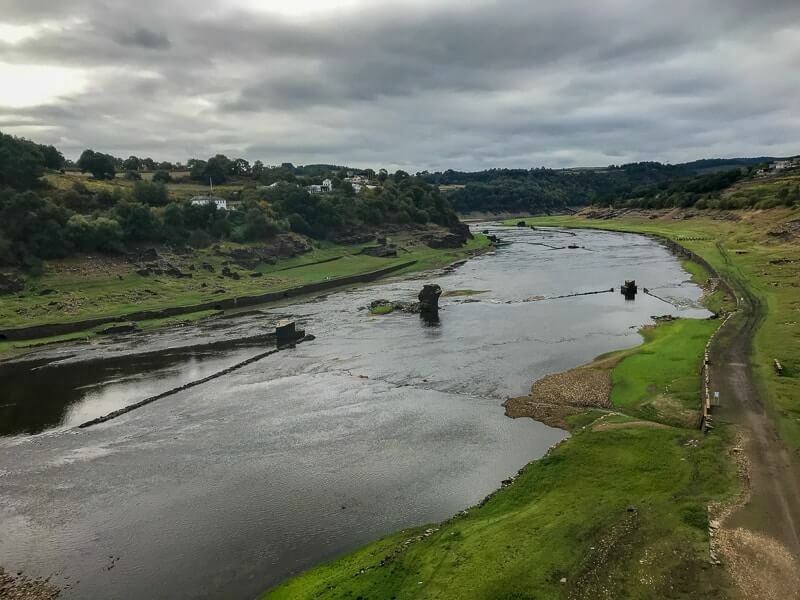 Look carefully and you can see the ancient buildings along the Miño River. The scenery along the way was nice, but not amazing. Everyone I know who has done the Camino de Santiago, even the last 100 km as I’m doing, has raved about it. Am I missing something? I know that some people do it to find answers to questions that perplex them. 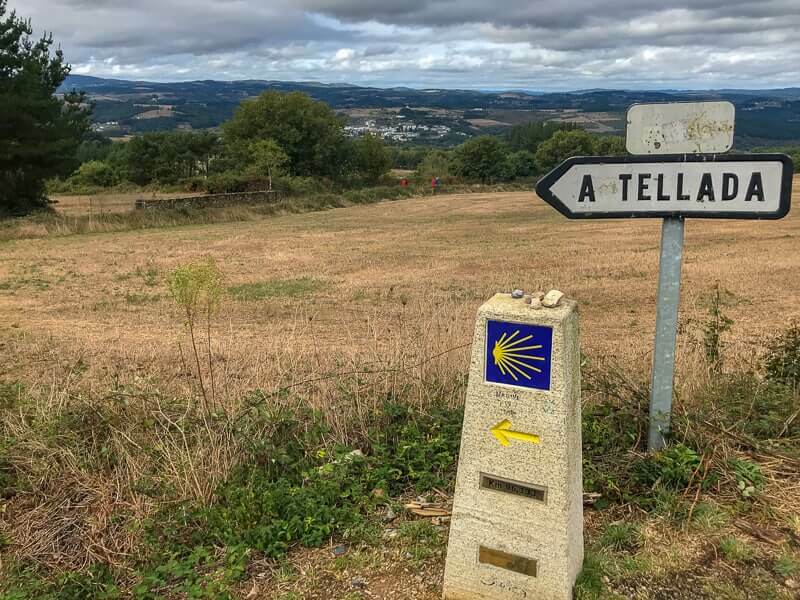 I do hiking trips for that reason too, but what makes the Camino de Santiago so special? Most pilgrims that I’ve observed are not even stopping in the churches that line the way. It’s not a judgement but if a pilgrim was doing the Camino for religious regions I’d totally get it. But from my observations that doesn’t seem to be the case. In any case, when I get back to my hotel that night, I immediately download and start reading Paulo Coelho’s The Pilgrimage. I wish I’d started reading it before my journey. If anyone can help me find meaning, it’s the wise Coelho. You’ll spend most of the day walking along roads, some which frankly are uninspiring. Fortunately, the scenery improves as the day moves on and gives way to forests and rolling hills. Meeting a fellow from Valencia and having a conversation about Kundalini yoga and energy. It’s a rather deep talk for someone that you’ve just met which made for very interesting conversation. Taking a second cappuccino break. I realized that I’d invented my own self-imposed rule of just one stop during the walk and realized that was rather stupid. Noticing that my senses seem to be improving. I’m observing more. I.e. peeling bark from the trees and my sense of smell seems more intense. The deep clouds in the forest from a viewpoint (see above). 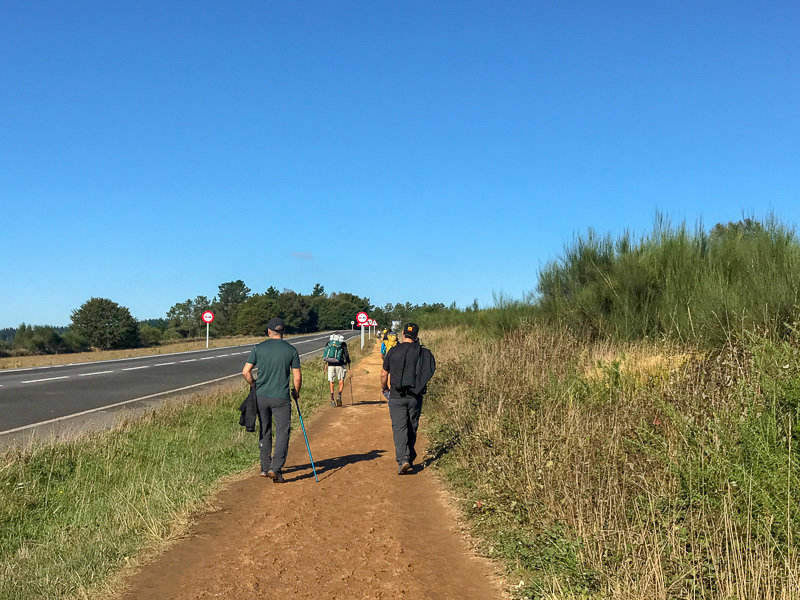 After leaving Portomarin, which I liked as did I like the walk in the forest, I was disappointed to see that the Camino was spent walking along a road. What? My doubts about the Camino resurfaced. Although admittedly they weren’t very hidden. Fortunately, the scenery did improve as the day went on. I get that many pilgrims do the journey to find themselves. But can’t they do it somewhere more scenic, like the stunning Italian Riviera? Still, I did have a couple of insights (see above). Maybe the Camino is starting to work its magic? Time will tell. In the meantime, I continue reading The Pilgrimage. This is the most scenic day of walking so far and as it turns out the entire trip. You’ll walk through medieval villages, numerous churches that are centuries old. Be sure to try the local speciality, fried octopus – pulpo in Spanish. Trust me you’ll want to try it. It’s SO good. Starting the day with a gorgeous sky. Sunrises are always one of my favourite times of day, although I’m not usually up early enough to see them. The good thing is that the sun doesn’t rise until quite late in northern Spain in October. This photo was taken at ~ 9:00 am. It’s moments like this that everything feels right in the world. Walking through the medieval villages, especially Furelos. It makes you feel like you’ve been transported back centuries. I finally had my breakthrough. I didn’t come to the Camino with a particular problem or issue I was trying to solve, but right as I was walking through the middle of a field, I came up with a subject for a book that I’m SO excited to write. I’ve wanted to write a book for a while but have struggled with what I’d write about. Seemingly, out of nowhere, I came up with it. I still have to flush out a lot of details, but I’m super excited . I think I’ve finally found what I think is the perfect book for me to write. I can’t wait to get started. My senses continue to develop. In addition to my heightened sense of smell, I also start to notice the crunch sound my boots make with every stop they take over the stones. While I loved the first part, both from a scenic point and a getting into the groove point. But unfortunately, halfway throughout the day I started to develop Plantar Fasciitis. It became increasingly painful as the day went on. I was shocked as this is the third long distance hike I’ve done since May (The Jordan Trail and the Path of Gods in Italy), and I hike every weekend. The last few hours were pure agony. I couldn’t wait to be done even though the day started off beautifully. Plus, 31 km is a very long day – even when you’re feeling good. I arrived at my hotel and slept soundly for an hour and then tried to work the kinks out of my feet. Inadvertently, I found a solution for dealing with Plantar Fasciitis. It doesn’t wreck the rest of your hike (more of that in a future post). Does that count as a Camino insight? I’m counting it as one. But just to be on the safe side, I continue reading The Pilgrimage. 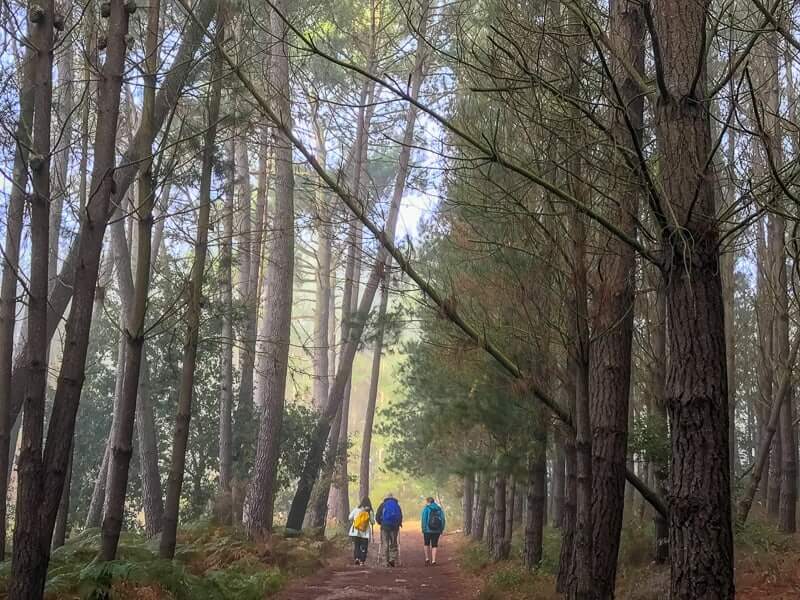 Today’s walk takes you through woodland, a eucalyptus forest and small villages. 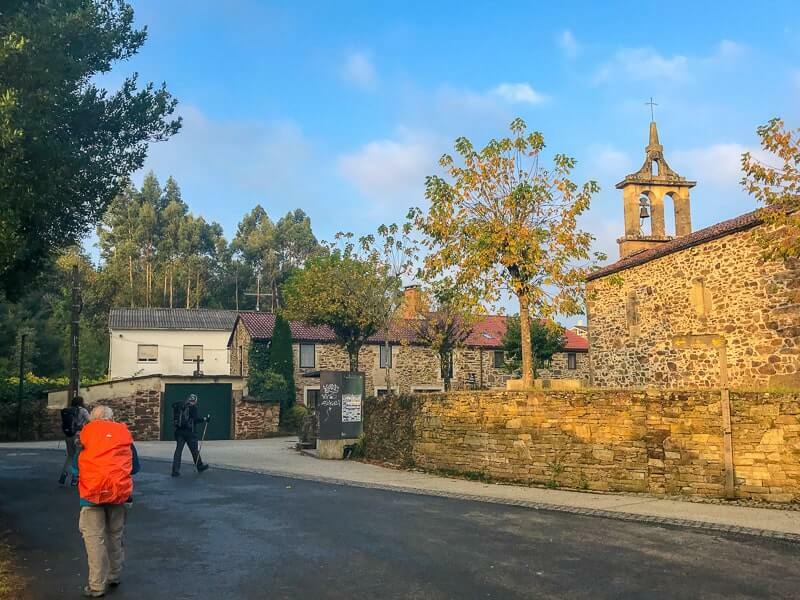 You’ll walk through the hamlet of A Rúa, one of the quietest points before reaching Santiago. The morning light. I had promised myself to start hiking earlier today to enjoy the most of the morning light but due to treating my Plantar Fasciitis started a bit later. But still, I was rewarded with magical morning light for the first half hour of my hike. I LOVED hiking through the eucalyptus forest. It’s my first time doing so and it’s the most fragrant forest I’ve ever been in. It smells like a combination of mint and honey. It’s my idea of heaven. I was grateful for my now heightened sense of smell to really savour it. I slowed my pace to prolong my time there. If you haven’t had the pleasure of hiking in a eucalyptus forest, put it on your bucket list – pronto! I started talking with an American lady from California. Within minutes we entered into a deep conversation about the best way to deal with life’s disappointments. 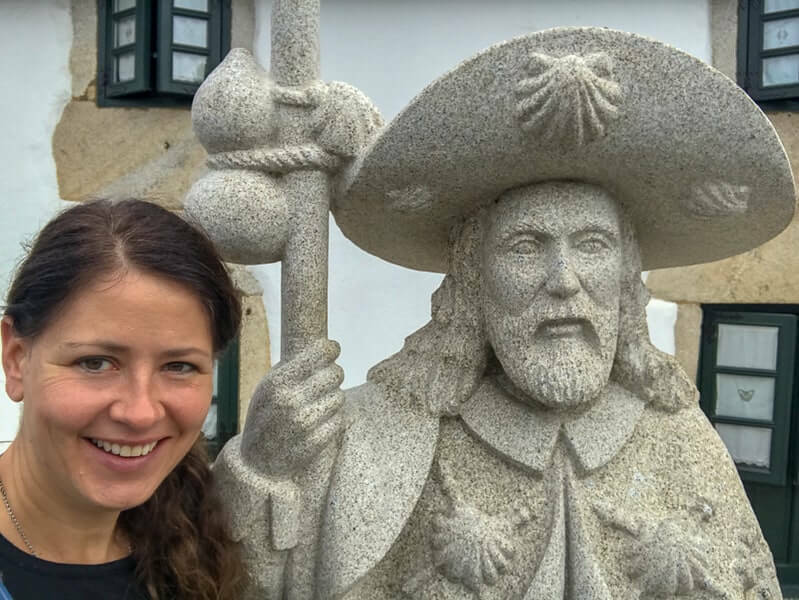 She said that her motivation for doing the Camino was to find peace and that she’d found it. So much so that she said she sometimes spontaneously found herself bursting into tears of happiness. Her openness touched me. And I loved hearing the effect the last 100 km of the Camino was having on her. Despite being in pain, today seemed to flow. I focused less on time and more on my surroundings. I noticed the light breeze that hit the right side of my cheek intermittently. Me happily hiking in the eucalyptus forest. The smell was incredible! I loved hiking in the morning light and all the forests but especially the eucalyptus forest. However, while parts of the trail were nice they were just nice. Maybe my expectations are too high, but I want more than nice from a hike. Still, I do feel I am benefitting from the Camino. Tomorrow is the last day. I’ll arrive in Santiago. I’m curious to see if I feel any different or have any epiphanies. Today is an exciting day – it’s the last day! 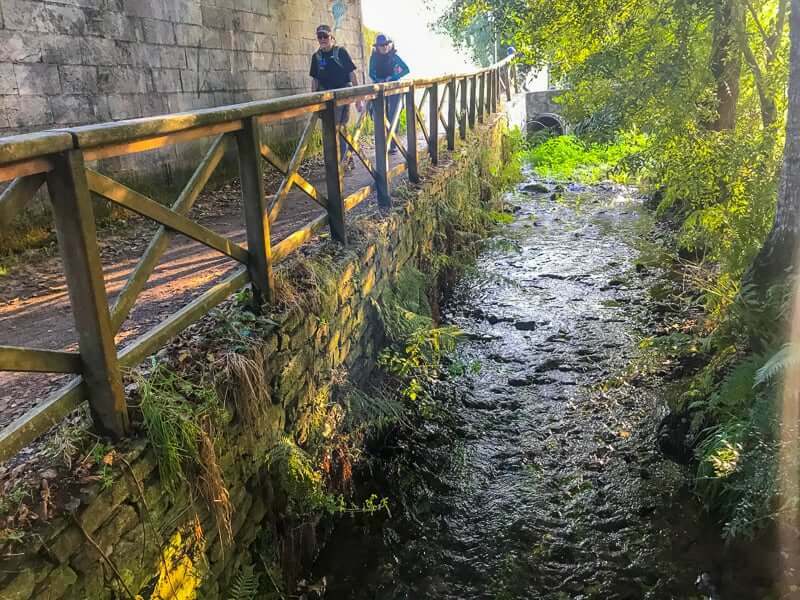 You’ll pass by Lavacolla, where traditionally pilgrims washed in the river before reaching Santiago de Compostela. Then you’ll walk on roads and forests until you reach Monte do Gozo “Mount of Joy” in English. At 368m it’s where you’ll get your first glimpse of the Cathedral of Santiago. It’s an easy day, leaving you lots of time to explore this gorgeous city which is a UNESCO World Heritage Site. I felt joyful the entire hike and strong. I hiked like I was on fire. I feel the effects of the Camino. Monte do Gozo offers beautiful views of Santiago. I tried to imagine how many pilgrims have felt the same sense of awe, especially the ones that hiked the entire route. After arriving in Santiago, I sat in front of the cathedral, taking time to reflect on my journey. Today was the least scenic of all the days. While there were some nice spots, for parts of it you’re walking by a major highway. The noise is an assault on the senses after so much quiet on the trail. You also walk near the airport. I’m a big fan of long-distance hikes as a way of re-discovering yourself. They’re a great way of taking the quiet time you need to listen to what you already know. But what we too often drown out with distractions in our daily lives. 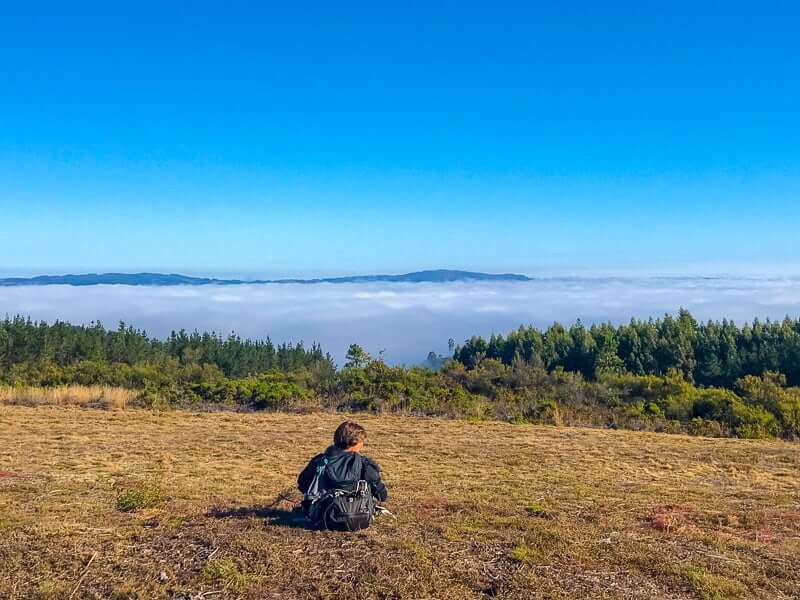 My takeaways from hiking the Camino de Santiago were a reminder to focus on being present and enjoying the moment – even when it’s mundane. It’s easier said than done. But I’m working on it. I’m also learning to rely more on my own internal strength and less on my surroundings. For example, not letting a less scenic part of the trail influence my mood. These are takeaways that will serve me well in all areas of my life. I let other people influence my mood too easily. I truly believe that hiking trips can change your life. I also got an idea for a book that I’m buzzing with excitement to write. I’ve wanted to write a book for a while but have struggled with the right topic. I finally got it on the Camino. Having said that, I was disappointed with the scenery. It was nice in places, but I never felt it was stunning. It was also not so nice in places – just walking along a road or beside a busy highway in others. The villages were nice, but in all honesty, Spain has tons of more stunning medieval villages. Some on other Caminos (which I’ve done parts of). Obviously, the history and the religious meaning play a big role for some people. But interestingly enough, none of the other pilgrims I spoke with were doing it specifically for religious reasons. Although there was often a spiritual element to their reason for doing it. When speaking with other pilgrims, everyone I spoke with said that they got what they wanted from it. Most agreed that while it was nice, it wasn’t amazing scenery. But they also said that the scenery wasn’t their main reason for doing it. 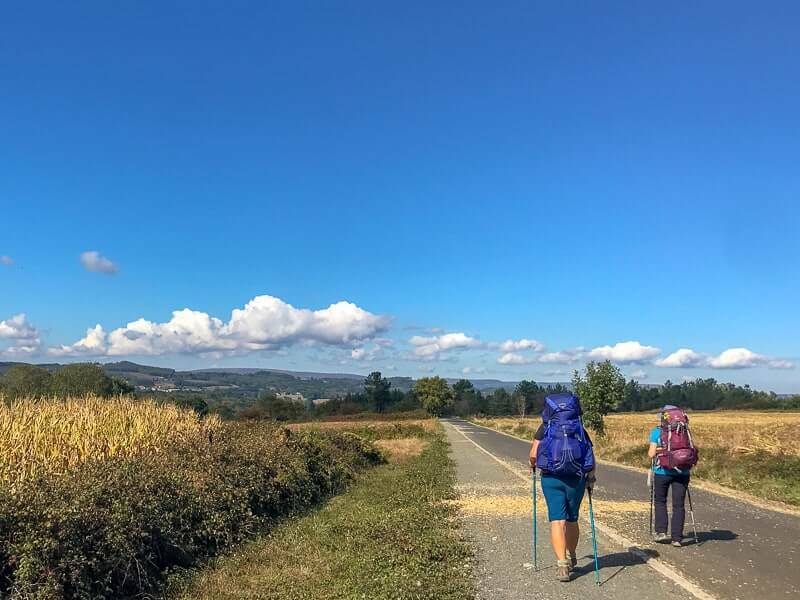 The lady I previously mentioned from California was doing the last 100 km of the Camino to find peace after several big losses in her life in the past year. She said she’d found it already on day 3. 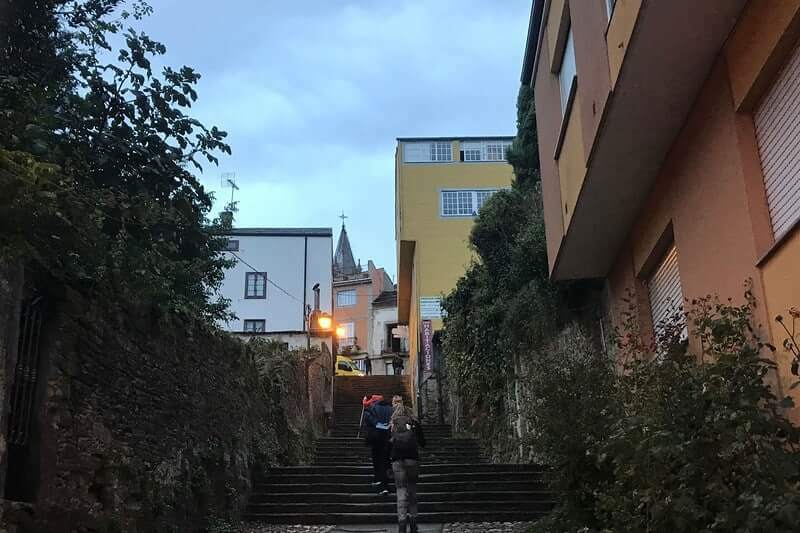 A Canadian lady I met was doing the whole Camino to figure out the next steps in her life. Her youngest daughter had just headed off to university. She said that the Camino had given her reflections she likely wouldn’t have gotten had she not done it. There are Pilgrim’s masses held two times a day, at 12:00 pm and 19:30. You don’t need to rush to be there for the noon one. There’s also a Pilgrim’s reflection available at the Pilgrims Office Mon-Sat at 10:00 and 14:30 pm. The botafumeiro – a 53kg incense vessel that’s swung through the width of the Cathedral on a rope to cleanse the Pilgrims is an incredible site to see. However, as of writing, there is no regular schedule for it. Check with the Tourist office when you arrive to see if it’s scheduled during your stay. 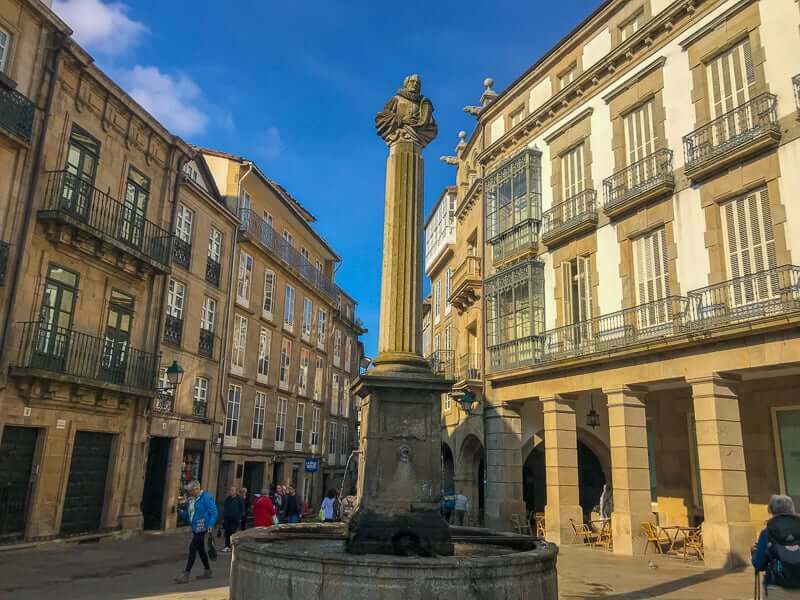 Assuming that you’ve been getting your Pilgrim’s Passport stamped along the way, once you’re in Santiago you can get your Compostela certificate from the Pilgrims Office. It’s located at Rúa Carretas, 33. But expect huge lines. When I arrived there were at least 200 pilgrims in line ahead of me. I ended up not getting it choosing to spend my time exploring Santiago instead. 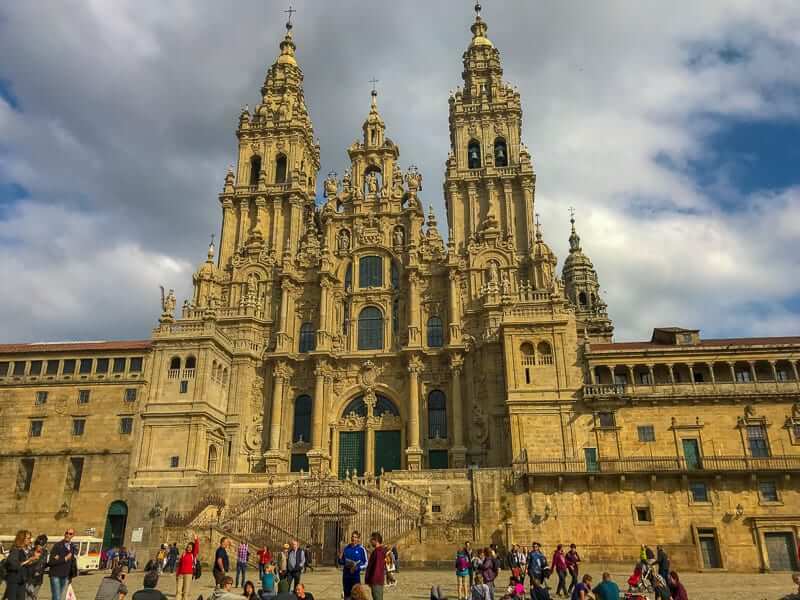 I’d highly recommend doing a tour of the Santiago de Compostela Cathedral and Museum. There’s so much history and the views from the rooftop are incredible. You miss so much if you just do it on your own. I did it with a guide on my first visit and was so glad that I did. If you have more time, consider a day tour to Cape Finisterre & Costa da Morte which departs from Santiago. If you have a car or know a local that does also visit Beach of the Cathedrals. It’s considered one of the best beaches in the world. You’ll need a reservation to get in as it’s very popular but SO worth it. I loved it. Note: My trip was made possible by CaminoWays.com. As always, all opinions are my own. If you use my booking code “monkeyscamino”, you’ll receive €20 off your own Camino and I’ll receive a commission at no extra cost to you. Thank you for this amazing breakdown of the last part of the trip! I've always wanted to do this hike! @Henry - My pleasure. I didn't love it as much as I wanted to but I'm still glad that I did it and I understand why people want to do it. Laurel, thanks for sharing your experience. I’m looking for something like this trip to do with my daughter who is graduating high school. I have done the Inca Trail which was amazing. Do you have any other recommended hiking trips? @Connie My pleasure and what a fun thing to do with your daughter. I'm hoping to do the Inca Trail next year. I'd recommend any of the hikes on this page: https://monkeysandmountains.com/adventure-tours/. I've done them all and have loved each of them.